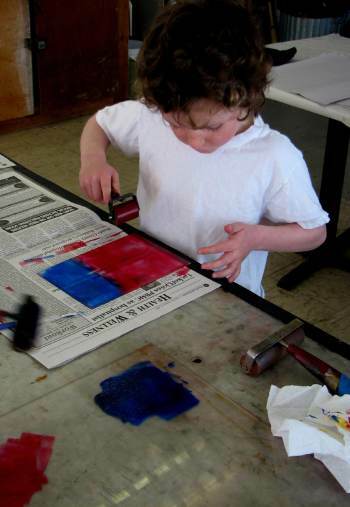 August is for Kids and Fun and Monotypes! On Monday afternoons in August, Debra Arter is teaching children the nuances of “Green” Printmaking, by using only non-toxic materials to create monotype prints. Children from Maine, and visitors from across the US and abroad, are enjoying the fun of creating masterpieces with the press. Ages 5 and up have been using the bellows bottles and needle tips, brayers, combs and a variety of techniques to create vibrant art. Each participant comes away with at least four prints, one of which is put into a mat and frame for immediate display. All work is titled, numbered and signed by the creators. Children enjoy helping each other discover new methods and how inks interact. Space is limited to seven participants. Call Debra at 563-7100 to register. Cost is $25 for one child or two for $40. Class meets from 1 – 3 pm on Mondays. Sessions for adults and teens are held on Wednesdays from 9 am – 12 pm, cost is $40 and includes all materials.